Look at the risen Lord Jesus. Welcome to my Christian Poetry website. All poems are written by me, Charles Breunig. On my site I sell Christian poetry bookmarks, 2 poetry books, and Christian Quote Notepads. I would like to invite you to take the time to read my poems. If you like a poem then buys a bookmark for yourself or a friend. Maybe you need to give a gift for a group of people at church. 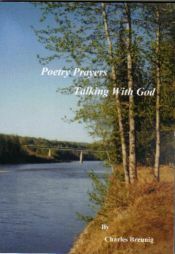 How about give a prayerful Christian poetry bookmark to each person. Buy one of my books. My books can be used as a prayer book. People have told me that they used my book when they are praying. Each poem, in my books, is a prayer. Writing poetry helped me to grow closer to our Lord. Everyone needs a notepad. My notepad has a different inspiration quote on the bottom of every page. I have 2 different kinds of notepads, and each of them has 50 pages. Sit back with a cup of coffee or tea, and please feel free to look through my products. Maybe you can find a special Christian gift for a friend or yourself. I hope you will enjoy your time that you spend on my website. You are welcome at any time to come back. I hope by having my products your daily inspirations will grow. I have set up PayPal for your convenience. You do not need to be a PayPal member to buy off my website. PayPal is a security and trust worthy way to make payments over the internet. For more information on PayPal please visit C. B. Creative Enterprises policy. If you would like to send me a money order, please make the money order to C. B. Creative Enterprises please visit C. B. Creative Enterprises policy.